Clair C. Patterson, Professor of Geochemistry at the California Institute of Technology, is honored for his study of the chemistry of natural lead in the environment and for his investigation of the environmental contamination resulting from human activities. 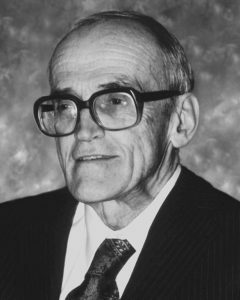 Dr. Patterson’s research subsequently alerted policy makers to the danger to human health world wide from lead exposure. His systematic and farreaching research on the pathways by which lead finds its way into the environment and into living organisms is a paean to the impact of one person’s persistence and precision. His painstaking investigative work broke new ground in analytical chemistry and his “clean room” techniques have revolutionized heavy metal marine chemistry. Dr. Patterson first gained international recognition in 1953 for a comparative analysis of lead from meteorites and from terrestrial sources on Earth. That classic study produced the currently accepted estimate of the age of the Earth at 4.6 billion years old. This finding has been repeatedly confirmed by numerous other forms of evidence and is now universally accepted. In his efforts to determine how much of the lead he was finding was a natural, background level, Dr. Patterson went literally to the ends of the earth to sample the snows of Greenland and Antarctica that had been lying undisturbed for hundreds and even thousands of years since being deposited by the wind. He developed novel techniques in order to conduct these extremely precise analyses. Snow from the northern hemisphere showed significant increases in lead corresponding with rising human usage. The samples showed, for example, an increase during the period in classical antiquity when lead was produced in quantity as a byproduct of silver mining and was used extensively in plumbing. Samples from Antarctica, isolated from most industrial activity by wind circulation patterns, showed far lower levels of lead. In the early 1960’s, Dr. Patterson developed a theory predicting that natural lead levels in the bodies of people from earlier periods of history were far lower than in the people of today. In a series of ingenious studies, he and his colleagues established that the quantities of lead are up to one thousand times greater now than in ancient times. After Dr. Patterson’s results began appearing in 1965, there was immediate evidence of heightened awareness of the industrial and regulatory implications of lead pollution. In 1979, Patterson found direct evidence in the analysis of 1600year old bones of Peruvian Indians. These bones had approximately the same amount of the metal barium (an element chemically similar to lead, but not widely used in industrial processes) as did modern remains, but carried far less lead (one seventh to one twelfth). Systematically investigating the pathways by which lead was finding its way into living organisms, Dr. Patterson and a coworker showed in 1973 that even a remote and unpopulated canyon in California’s Sierra Nevada was polluted by lead from automobile exhaust fumes. In 1975, they demonstrated that lead in this form overwhelmed normal plant and animal defenses against absorbing the metal. In 1980, Dr. Patterson used his clean room techniques to measure the amount of lead in canned albacore tuna. Government labs had found relatively little variation between fresh and canned fish. Patterson’s analytical tools found more than a thousand fold difference in lead. The chain of lead contamination that Dr. Patterson traced from the gas pump and other sources to the human blood stream has resulted in revolutionary changes in public policy. His findings gave rise to a political effort that resulted in a phased end to the sale of leaded gasoline in the Clean Air Act of 1970. Other government action has removed lead from paints, water pipes, food containers, and smelters. Dr. Patterson is a member of the National Academy of Sciences, and holds honorary degrees from the University of Paris and from Grinnell College. His previous honors include the J. Lawrence Smith Medal of the NAS and the V .M. Goldschmidt Medal of the Geochemical Society.